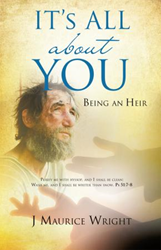 J Maurice Wright’s new book, It’s All About You – Being An Heir, ($10.99, paperback, 9781498403399; $5.99, e-book, 9781498414371) presents a thoughtful examination of God’s seven major covenants as each pertains to the God/man relationship. Focusing on the intricacies, this book carefully reviews the nature and historical significance of “covenant” in contemporary Christian theology. It also extends the readers thinking to the “why?” that is critical to the relevance of covenant in a theological and relational context. The book’s theme stresses how covenant demands create uniformity of rewards as well as showing no favoritism when dealing with curses associated with sins. This book brings the reader to understand the difference between keeping covenant law or being a “bondservant.” It also explains that covenant-keeping demands work or a “have to” mentality. He believes that Grace creates a “want to” mentality or a willing, “Slave of the Christ” and that freedom in Christ is the essence of Christianity. J Maurice Wright was raised in a dedicated Christian family. He has been active in church activities and leadership, serving as deacon and elder along with Janiece, his wife of 60 years. He has questioned sacrament practices and was motivated to pursue an understanding of subjects such as covenant, works, household and grace. Learning to write has been a challenge but he desires to share his thoughts in his book as well as in his blog found on his website: mauricewrightbooks.com. Xulon Press, a division of Salem Media Group, is the world’s largest Christian self-publisher, with more than 15,000 titles published to date. Retailers may order It’s All About You – Being An Heir through Ingram Book Company and/or Spring Arbor Book Distributors. The book is available online through xulonpress.com/bookstore, amazon.com, and barnesandnoble.com.